Configuring Envelopes - Douglas Computing, Inc. This section of the documentation is very similar to the Configure An Envelope section of the documentation. This section is associated with using the DC Envelope Printer in Bulk Mail mode, as opposed to Single Envelopes mode. Before you print out envelopes, you must first configure them by setting the envelope size, the addressor, the mailing list, along with other information. Below are instructions on how you may go about doing so. 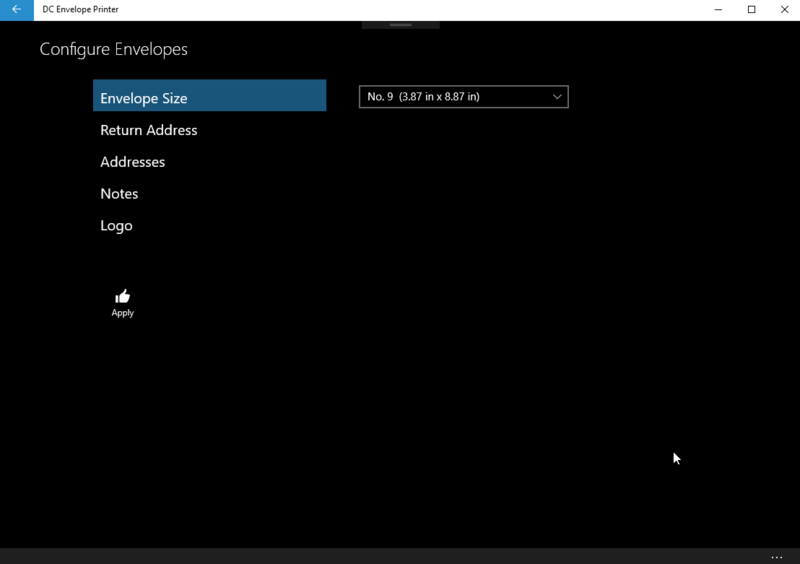 To access the Configure Envelopes page, from the bulk mail main page of the app, click on the Configure button on the bottom menu bar for the page. To the left of the Configure Envelopes page, is a list of buttons - Envelope Size, Return Address, Addresses, Notes, and Logo - that you can click on, to configure the different aspects of your envelopes. Click on the Envelope Size button to select the size of the envelopes you want. Click on the Return Address button, to select the return address record in the app's database, you would like printed on your envelopes by default. Note: you can also select the font and font size you would like for your return address. Next, click on the Addresses button, to bring up the Addresses page, which is used to create and retrieve mailing lists, as well as to select the font and font size you would like your addresses to have. Click on the Notes button, and check whether you would like to have a horizontal note displayed in the middle of your envelopes, and / or check whether would like a note displayed to the left of your addresses. As for your return address, you can directly select the font and font sizes that are used in each of your notes. Finally, click on the Logo button, and check whether you would like a logo, which you loaded into the DC Envelope Printer app, to be added to your envelopes. (See here for more information on how you can load and configure logos for placement on your envelopes.) If you are happy with your selections, click on the Apply button, at the left of the page, to apply your selections to your envelopes. If you do not want to apply your selections, click on the large back arrow, at the top left of the page, to back out of applying your selections to your envelopes. Note: similar with the Configure Envelope page - used in the Single Envelopes mode of the DC Envelope Printer - you can enter the Configure Envelopes page and directly apply the saved settings on the page to the set of envelopes present in the bulk mail main page of the app. You don't have to adjust each setting, before applying all the settings to the bulk mail main page. There may be times however, when you encounter the error shown in the screenshot below. 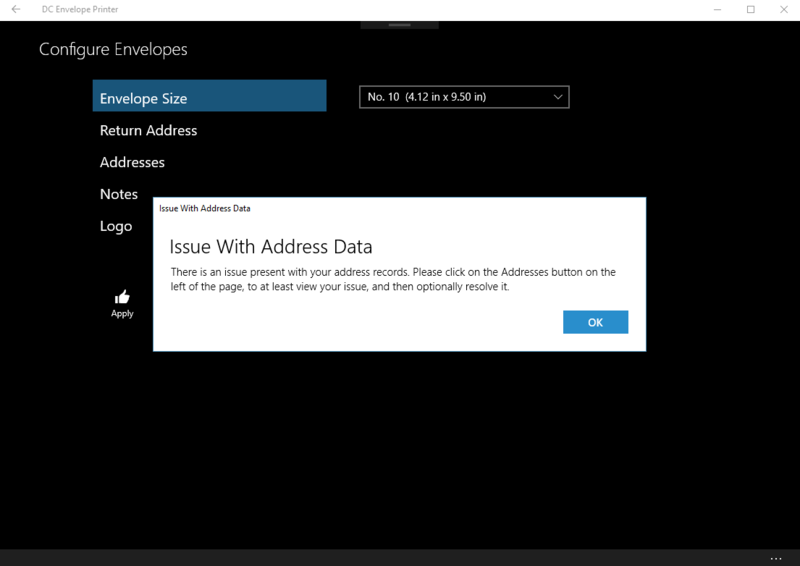 If you do, follow the instructions provided in the error message, by clicking on the Addresses button on the left of the Configure Envelopes page, and investigating the matter. Refer to the section Unmatched IDs here, to deal with the matter. Please note: the Notes and Logo features are in-app purchase features. This means they are free to use for a trial period of 7 days, but afterwards, will have to be purchased, in order to be used permanently.